San Clemente, located on the coast of California in Orange County, is a great weekend getaway from Los Angeles and San Diego. The beautiful downtown area is perfect for shopping and strolling, while the scenic San Clemente Pier is a great spot for admiring colorful sunsets over the Pacific. 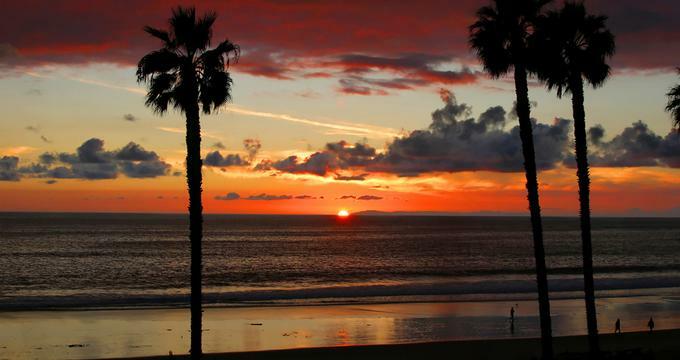 San Clemente, CA, is home to beautiful sandy beaches, museums, attractions and great restaurants. Here are the best things to do in San Clemente. Avenida Del Mar in downtown San Clemente is a shopper’s paradise and home to an array of trendy boutiques, designer and brand stores, art galleries, quirky cafés, bustling restaurants and sophisticated wine bars. Fondly known as the beating heart of San Clemente, also known as the ‘Spanish Village by the Sea,’ Del Mar Street is a short walk from the San Clemente Pier and offers a wealth of entertainment both day and night. Spend the afternoon strolling through the shops where you are bound to find something for the kids at Petit Bonhomme, sports beach wear at Killer Dana and trendy ladies wear at upscale boutiques like Rascal's, Angel Wings and Bliss. Once done, enjoy a light lunch of Italian at Carbonara’s Trattoria, Mexican at La Siesta or sushi at Del Mar Sushi. Located at the very end of Del Mar Street, The San Clemente Pier is one of the city’s most popular attractions. Surrounded by miles of sandy beaches and crashing waves, the pier and its famous clock tower offer beautiful views of the coastline and the city, during the day and at night. There are many benches on the pier on which to sit and soak up the stunning views as you listen to the waves crashing on the shore. During the summer months, the sides of the pier are packed with surfers waiting for the perfect wave and sitting in the sunshine and people watching is a favorite pastime of the locals. Another favorite activity on the pier is fishing, with plenty of fisherman lining the sides. The pier also offers a variety of places to eat from fast food to sit-down dining with lovely sea views. The Fisherman's Restaurant & Bar serves fresh seafood and the Oyster Bar is a good place for sundowners. Beginning at the North Beach train station and running for five miles south towards San Clemente State Beach, the San Clemente Beach Trail is the perfect way to explore the beautiful San Clemente coastline. The beach trail passes by many of the beaches in San Clemente, as well as the San Clemente Pier, T-Street, the downtown district and a variety of parks, volleyball courts and many restaurants. The Beach Trail is pet-friendly and offers pet hygiene stations along the way while several beaches have public restrooms and concessions for two-legged walkers and joggers. The Trail is fantastic at all times of the day with fresh, ocean breezes in the morning and cool starry nights when the sun goes down. San Clemente State Beach is located at the south end of the city and is one of Orange County’s most popular beach campsites. Stretching between the breaking ocean surf and the foot of a steep bluff for a mile, San Clemente State Beach is surrounded by beautiful ocean, hill and mountain views and enjoys a temperate climate. San Clemente State Beach offers an array of campsites for motorhomes, caravans and tents overlooking the spectacular beaches of San Onofre with restrooms, indoor and outdoor showers and drinking water. Perched on a bluff overlooking the historic San Clemente Pier, the magnificent Casa Romantica celebrates the history, culture and ecology of California. Built in 1927 by a well-known architect of the time, Carl Lindbloom, for the founder of San Clemente Ole Hanson, the seven-bedroom, seven-bathroom home offers a tangible journey back in time. Casa Romantica is surrounded by five acres of beautifully landscaped estate gardens that are home to winding trails and walking paths, flowering shrubs, cacti and other endemic species, as well as breathtaking ocean views. Listed on the National Register of Historic Places, Casa Romantica has been transformed into a multi-purpose museum and function center for the community to enjoy. San Onofre State Beach is one of California's most famous beaches, welcoming more than 2.5 million visitors per year who come to surf, swim, sunbathe, camp, kayak, fish, and cycle. Rated as one of the top five most-visited state parks in California, San Onofre State Beach has three distinct areas, namely the San Onofre Bluffs, the San Mateo Campground and the San Onofre Surf Beach. San Onofre Bluffs is popular with swimmers and surfers and offers camping next to the sandstone bluffs. San Onofre Surf Beach is for day use only and offers several surf breaks ranging from gentle breaking waves for beginners to one of the world’s most consistent breaks at Trestles. The Surfing Heritage and Culture Center is a community-based organization that celebrates the sport of surfing. The center is dedicated to preserving, presenting and promoting the heritage of surfing for the appreciation and education of future generations. The center also aims to inspire and encourage people to understand and share their passion and love for surfing. The Center covers the full spectrum of surfing from its history and development to current trends, and houses significant surfboards and other objects of cultural value as well as awe-inspiring photography. Serving as a symbolic center for the wave riding culture in the United States, this world-class museum/resource facility also offers educational and outreach programs that support and promote the sport on all levels. Named for being the northernmost beach along the San Clemente Coastline, San Clemente North Beach sits along the San Clemente Beach Trail and offers a variety of activities to enjoy including walking, swimming, picnics, bonfires and cookouts. Picnic tables and barbecue pits are scattered along the beach, as well as concessions and restrooms and there is a small playground with swings and other equipment for the kids. Located near to the train station at the corner of Pico and El Camino Real, access to the beach is easy with plenty of parking within walking distance. While dogs are not allowed on the beach, they can be walked along the surrounding beach trails. Set high above the hills of San Clemente, Talega Golf Club features par 72, 18-hole championship golf course, a Spanish colonial clubhouse and beautiful views. Tthe Fred Couples Signature course offers one of the best golfing experiences in Southern California. Established in 2001, Talega features 18-holes, a driving range, a beautiful Spanish colonial clubhouse with a bell tower and village courtyard setting, a restaurant and bar, a pro shop and a gift shop. Talega Golf Club is home to the Signature Grille and Bar that offers breakfast “on the go” at the Deli every morning, and midday lunch in the dining room or out on the patio. The Signature Grille and its private patio are available for private events and the Grille’s bar serves a variety of libations to accompany the cuisine. Offering an unforgettable Wine Country dining experience, VINE Restaurant is home to a rustic, contemporary wine bar, open kitchen and semi-private dining table that can be booked for private events. The Restaurant offers guests an exceptional dining experience paired with award-winning wines from the Napa Valley and other wine producing regions, with over 25 labels to choose from. Beautifully furnished in warm earthy tones with comfortable seating and soft lighting, VINE’s culinary team creates a menu of dishes made from scratch with fresh, locally sourced ingredients and presented with passion and flair. Signature dishes include hand-reared meats, freshly caught seafood and handpicked fruit and vegetables, and a diverse selection of beverages ranging from artisan craft beers and handcrafted cocktails to over 25 worldwide wine selections by the glass. If it’s cozy, comfort food and a casual, relaxed ambiance that you are looking for, then Iva Lee's is the place to be. Named after Iva Lee, who was born and raised in the South, the quaint little restaurant serves some of the best Southern food in the county, from fried green tomatoes and jambalaya to sweet potato fries and meatloaf. Open for dinner from Tuesday through Saturday, Iva Lee’s is also the spot to go for laid-back blues and jazz music while you dine on Thursday, Friday or Saturday evenings. Courtney’s SandCastle Universal Playground is a universal playground that has been primarily designed for children with physical, mental and sensory disabilities to provide an array of fun and interactive play opportunities for children of all ages. Named for Courtney Faye Smith, who has been confined to a wheelchair because of a rare muscular degenerative disease, Courtney’s SandCastle Universal Playground aims to improve the quality of life through fostering acceptance, awareness and diversity. Designed by Richard Fisher, the Playground includes structure such as a simulated 150-square foot ship themed play structure, with a stern wheel and talking tubes, a climbing rock, a mock castle themed play structure with sloping wheelchair accessible ramps and bucket swings. A beautiful Sensory Garden features aromatic plants, bushes and plants, a musical pathway and several interactive water features. 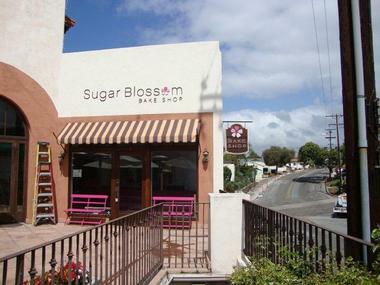 Sugar Blossom is a boutique bakery and shop that sells a variety of sweet treats, pastries and confectionary, including cupcakes, cookies and specialty cakes. Using only the highest quality ingredients, such as Madagascar bourbon vanilla, Valrhona, and Callebaut chocolates, goods are baked on-site every day and can be ordered for special occasions including weddings, birthdays and baby showers. Sugar Blossom boasts a vibrant, elegant space, designed by LA-based interior designer Seyie Putsure of Seyie Design, with bright overhead lights to showcase their mouth-watering goods. Outlets at San Clemente provides a wealth of high-end shopping, dining and other entertainment under one roof. Boasting beautiful views of the ocean off the 5 freeway, the Spanish hacienda-style Outlets at San Clemente features over 45 retailers spanning 500,000 square feet in an impressive outdoor shopping center. A selection of deluxe services and amenities add to the overall experience. 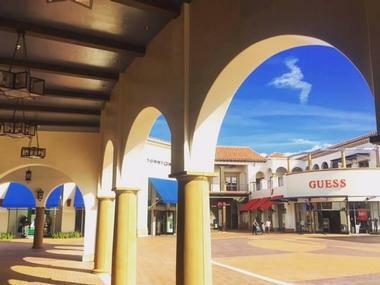 The Outlet Mall offers a range of popular brands and high-end retailers including Under Armour, Levis, Calvin Klein, Nike, Sunglasses Hut and more, as well as fast food establishments and full-service restaurants. Outlets at San Clemente also offers shoppers state-of-the-art amenities such as complimentary high-speed wireless Internet, pet-friendly cleanup stations, covered/indoor parking, VIP loyalty program with members-only lounge, bag check as well as stroller and wheelchair rentals. The final development will feature up to 70 stores and 12 restaurants, including four eateries with ocean views. 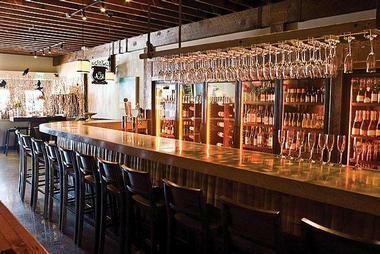 The Cellar is an artisan cheese shop and eatery in the heart of the famous Del Mar Street that serves a menu of all-American cuisine, consisting of sharing platters, cheese boards and hearty mains. Boasting a cellar-like ambiance with dark woods and a warm and welcoming vibe, The Cellar is more than a cheese shop – it’s a good spot to enjoy good food, wine, live music and of course, cheese. In addition to offering a wide variety of high-quality cheese, the menu consists of tasty small plates, salads and substantial entrees, such as stacked burgers, mac ‘n cheese, juicy short ribs and perfectly grilled salmon. The Cellar is also a gathering place for locals and visitors alike and hosts a variety of weekly and monthly events throughout the year. The Brewery boasts a beautiful space with subtle but impactful design elements of hand-stained wood panels, custom wood benches and tables as well as windows with flip-up glass panels that create a social bar space and let in the coastal winds. 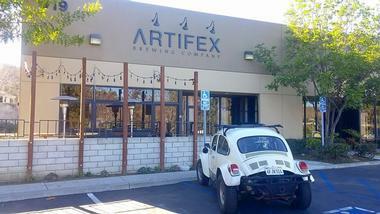 Artifex features some great beers including Hibiscus-This Ale, Afternoon Tea Brown Ale and No Name IPA. Artifex serves an excellent variety of beers on tap. “Food Truck Fridays” are a great time to grab a brew and some good food during happy hour. 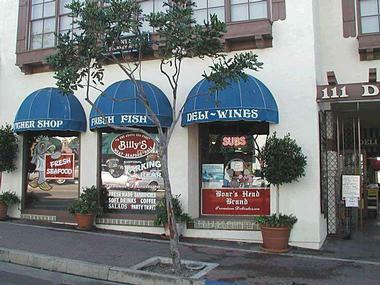 Billy’s is an award-winning deli in the heart of San Clemente that serves a variety of delicious deli fare from curated meats and cheeses to freshly prepared salads, homemade soups, fresh seafood, barbecue meats and specialty wines. Visitors can purchase the food and take it away or enjoy it outside on the comfortable dog-friendly patio that offers comfortable seating in a shady, relaxed setting. The first Sunday of every month sees live music and entertainment for guests’ pleasure. An outside fresh produce and fruit stand give the deli a French market appeal while a unique selection of craft beers, ales and wines from around the world are available to enjoy on the patio or take away. 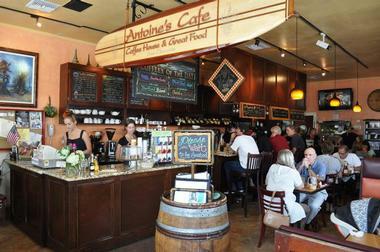 Antoine’s Café is a family-friendly neighborhood café that has been serving San Clemente locals’ breakfast and lunch for more than 15 years. Offering a casual, relaxed setting in which to enjoy delicious, home-cooked food, the small, cozy café is always packed and enjoys a vibrant, bustling ambiance. Breakfasts include healthy omelets, eggs benedict, French toast or classic bacon and eggs while lunches can be light or hearty with dishes such as homemade soups, fresh salads, juicy burgers and traditional French Croque Monsieur. Freshly brewed gourmet coffee is available all day, along with mimosas with fresh squeezed orange juice. Antoine’s Café is open seven days a week for breakfast and lunch. 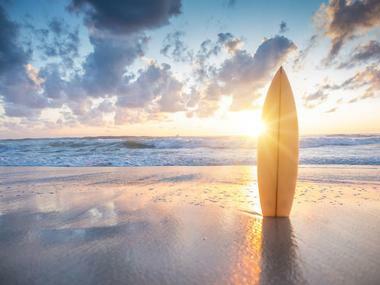 Learn how to surf and enjoy some of the world’s best waves with the San Clemente Surf School. The SCSS is a year-round school that offers a variety of surfing lessons for all ages and levels from beginner to advanced. Run by an experienced group of surf instructors, lessons start with 10-15 minutes of land instruction including ocean awareness, wave judgment and surf etiquette, then it’s time to hit the water to practice balancing exercises and paddling before dropping in and riding a wave. Instructors are experienced surfers themselves and trained in lifesaving and CPR. Surfboards and wetsuits are included as part of the lesson. The SCSS also has a Surf Team program, which encourages learners to continue surfing and improving their skills in a fun, safe environment.